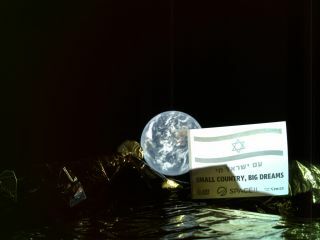 Israel's Beresheet lunar lander captured this selfie, which was released March 5, when the spacecraft was 23,363.5 miles (37,600 kilometers) from Earth. Australia is clearly visible. Beresheet also snapped another selfie at about the same time. This other photo shows a tiny sliver of Earth peeking above the spacecraft's body.